5a-Hydroxy Laxogenin is an ingredient Hi-Tech perfected via our synthesis process better than anyone in the industry, given our 23-year history with this ingredient. Hi-Tech’s founder used every 5a-Hydroxy Laxogenin going back to the original Mesobolin, put out by Amino Discounters in the early 1990’s. For men, Hi-Tech recommends using this product with IGF-1 products like our Pro IGF-1 to assist in lean mass gains. 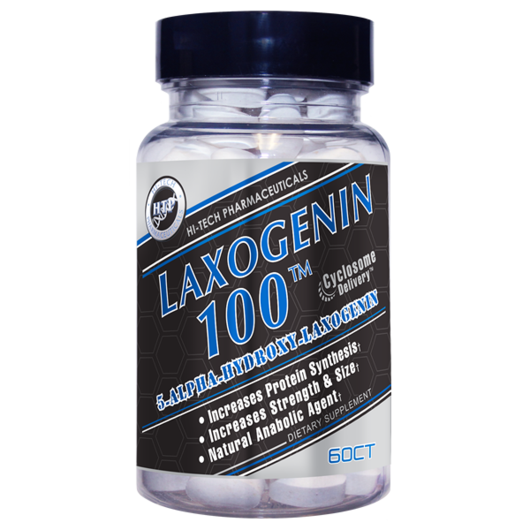 For females Laxogenin 100™ can be taken by itself and not cause androgenic side effects. Anyone who wants to build muscle and/or enhance athletic performance. Any bodybuilder/athlete already using legal prohormones, HGH releasers, and/or Creatine supplements who wants to promote muscle growth. Anyone who wants a supplement that will complement (rather than be redundant to) his or her current athletic supplement stack. Athletes who are avoiding androgen supplements (e.g., women), but still want to promote muscle growth and promote protein synthesis. Equally safe for use by men and women.